Join and Share The Facebook Event. Brian Powers - Heather Warburton - L@rk Lo - Christian Perez - Randi Alston - Diane Moxley - Madelyn Hoffman - Devon Bowers - And More! Because of the contributions of our comrades we are becoming a growing resource for the left. By getting involved with NJRR your activist group can get its message out the the community faster and stay informed about others working for social justice around the state. We provide a media outlet and information for people fighting capitalism. Capitalist Tears Mugs $25 Each. FALL FUNDRAISER: SUPPORT 100 MORE EPISODES! 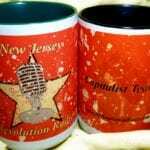 We need your support to make sure that we can grow and improve our socialist podcasts, news, and activist community updates to New Jersey. Please help us meet our goal of $2000 and we will keep growing this social revolution! Click Here To Give on GoFundMe.